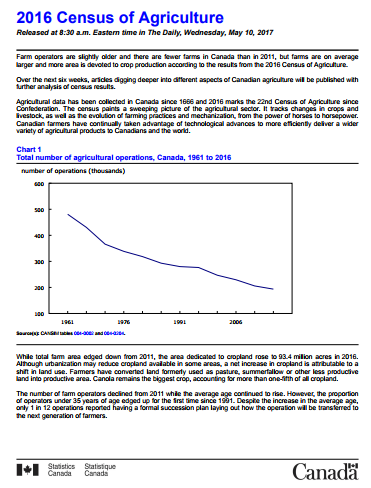 As Canada celebrates it’s 150th anniversary of Confederation, the 2016 Canadian Census of Agriculture has been released, informing some trends in the sector over the long-term and since the last census in 2011. The Census provides a statistical portrait of the country’s agriculture industry and its operators and families, while tracking important changes and the evolution of farming practices. The industry has certainly grown, adapted and moved through many changes over the past 150+ years—the average farm area is now 820 acres per farm, which is eight times larger than in 1871—but amidst many changes, Canada remains one of the world’s leading exporters of agriculture products, with total farm sales reaching $69.4 billion in 2015. While the farms are larger on average in size, the latest census shows that Canada has fewer farms than in 2011 (with more area, 93.4 million acres, devoted to crop production). Fewer but larger farms is a trend that’s also mirrored here in the Golden Horseshoe, found in our Agriculture and Agri-Food Economic Profile report. The 2016 census counted 193,492 farms in the country, which is down 5.9% from 2011. However, it’s worth noting this rate of decline in farms is the lowest it’s been in 20 years. The census also reveals that the number of farm operators has declined from 2011, while the average age of farmers continues to rise (55 years and old is the fastest growing age group of farm operators). Despite this increase in average age, only 1 in 12 operations reported having a formal succession plan (the census also shows that corporations are more likely to have succession plans). This points to a likely area of focus for the near future. But of optimistic interest, the proportion of operators under the age of 35 slightly increased for the first time since 1991, from 24,120 in 2011 to 24,850 in 2016. The census also found that a large portion (44.4%) of all farm operators also did some off-farm work, typically to supplement their income. Oilseed and grain-type farms remained the most common type of farm. Fruits, berries, and nuts acreage rose 6.7% from 2011. All information above is from Statistics Canada and is just a snapshot of the findings, be sure to learn more from Stats Canada on their website. For more, the Ontario Ministry of Agriculture, Food and Rural Affairs has pulled together census data for Ontario specifically. Canada has been collecting agricultural data since 1666, with 2016 marking the 22nd Census of Agriculture since Confederation. The Golden Horseshoe Food and Farming Alliance (GHFFA) is a partnership between the Toronto Region Conservation Authority, the Friends of the Greenbelt, the Ontario Ministry of Agriculture, Food and Rural Affairs, and the regional municipalities and Federations of Agriculture in Niagara, Peel, Halton, York, and Durham, and the cities of Hamilton and Toronto. In 2012, the GHFFA released the Golden Horseshoe Food and Farming Action Plan 2021, which identifies pathways for a more integrated and coordinated approach to food and farming viability in the area to ensure that the Golden Horseshoe retains, enhances and expands its role as a leading food and farming cluster.